The growing adoption of sustainable packaging with biodegradable and eco-friendly materials has triggered a huge demand for sack kraft paper in recent times. The demand for this type of paper is expected soar in the coming years as this material shows strength equal to synthetic or plastic materials. The global sack kraft paper is expected to be worth US$10.5 bn by the end of 2024 as compared to US$8.4 bn in 2015. The researchers estimate that the global market will expand at a CAGR of 2.6% during the forecast period of 2016 and 2024. Some of the factors that are expected to fuel the demand for sack kraft paper are features such as porosity, extensibility, printability, durability. Furthermore, this paper is also known to offer an exceptional high Tensile Energy Absorption (TEA) index of 3.8 J/g and is thus being used for industrial purposes. The booming cement industry in the developing economies of East Asia, Africa, and the Middle East have augmented the demand for sack kraft paper. The continued growth of the construction industry across the globe as the overall economy recovers from the recent slowdown is expected to boost the uptake of sack kraft paper as well. Builders are expected to use sack kraft paper in lieu of cement to build multiwall paper sacks for packaging, which is also projected to have a positive impact on the revenue of the global market. This material is known to act as a filter, which allows quick de-aeration and a high filling speed. Thus it has earned the status of being an excellent substitute for plastics that are regularly used in industrial packaging. The growing concerns amongst governments and environmentalists about the hazards of using plastic is forcing them to focus on greener alternatives. The demand for sack kraft paper is also being fueled by the steady ban on the distribution and production of plastics in several countries of the world. The ongoing technological advancements that have made sack kraft paper noticeably moisture resistant are also projected to fuel the demand for this material. In terms of geography, the global sack kraft paper market is segmented into Asia Pacific, Latin America, North America, Europe, and the Middle East and Africa. The analysts state that the global market is being led by the Middle East and Africa and Asia Pacific. Collectively, the sack kraft paper market in these regions is expected to register a CAGR of 3.4% during the forecast period of 2016 and 2024 in terms of revenue. The rise in construction activities and the growing demand for cement and other materials for building purposes is expected to lend a serious impetus to the growth of the overall sack kraft paper market. Additionally, the relentless demand for pet food and animal feed is also playing a crucial role in the growing demand for sack kraft paper in these regions. Currently, China holds a share of 55.9% in the Asia Pacific sack kraft paper market and is expected to offer lucrative opportunities to the overall market. On the other hand, North America and Europe will show sluggish demand during the forecast period as the markets are reaching a saturation point. Some of the leading players operating in the global sack kraft paper market are Canfor Corporation, The Mondi Group plc, Nordic Paper Holding AB, Segezha Group, BillerudKorsnas AB, KapStone Paper and Packaging Corporation, Gascogne SA, Natron-Hayat d.o.o., Tolko Industries Ltd., and Horizon Pulp & Paper Ltd. 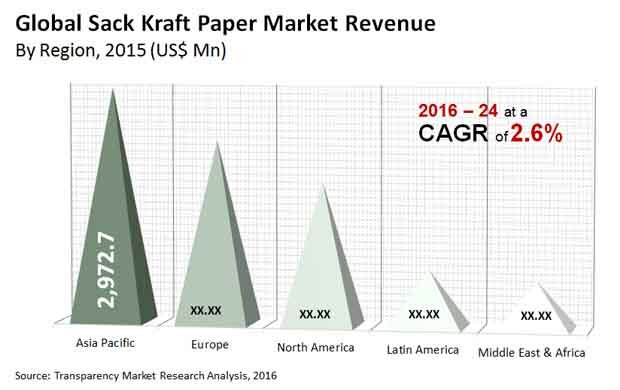 This report provides forecast and analysis of the sack kraft paper market on the global and regional level. The study provides historic data of 2015 along with forecast from 2016 to 2024 based on volume (‘000 MT) and revenue (US$ Mn). It includes drivers, restraints and the ongoing trend of the sack kraft paper market along with their impact on demand during the forecast period. The report also comprises the study of opportunities available in the market for sack kraft paper on the global and regional level. It includes value chain analysis with list of pulp manufacturers, sack kraft paper manufacturers, sack manufacturers and end users in the value chain. In order to provide the users of this report with comprehensive view of market, we have included detailed competitiveness analysis and company players. The competitive dashboard provides detailed comparison of sack kraft paper manufacturers on parameters such as company’s revenue, market share, unique selling propositions and key strategic developments. The study encompasses market attractiveness analysis, by grade, packaging type, end-use industry and by geographic region. Market statistics have been estimated based on average consumption and weighted average pricing of sack kraft paper by grade and the revenue is derived through regional pricing trends. Market size and forecast for each segment have been provided in the context of global and regional markets. The sack kraft paper market has been analyzed based on expected demand. Prices considered for the calculation of revenue are average regional prices obtained through primary quotes from numerous sack kraft paper manufacturers, suppliers, and distributors. All key end users have been considered and potential applications have been estimated on the basis of secondary sources and feedback from primary respondents. Regional demand patterns have been considered while estimating the market for various end users of sack kraft paper in different regions. Top-down approach has been used to estimate the sack kraft paper market by regions. Market numbers for global grade, packaging type and end-use industry segments have been derived using the bottom-up approach, which is cumulative of each region’s demand. The market has been forecast based on constant currency rates. Examining the end use industry, the report highlights that cement and building material segment accounted for significant value share in global sack kraft paper market in 2015, and is anticipated to increase at a CAGR of 2.2% over the forecast period. This segment is expected to account for 58.7% of the total sack kraft paper market by 2024. Chemicals segment accounted for 7.6% in 2015 and is expected to exhibit high CAGR of 3.6% as compared to other end-use industry segments. The animal feed segment is expected to increase 1.3X in terms of revenue by 2024 and create an incremental opportunity of US$ 309.7 Mn. Food segment accounted for 12.0% in 2015 and is expected to grow at a CAGR of 3.1% over the forecast period. A number of primary and secondary sources were consulted during the course of the study. Secondary sources include Factiva, World Bank, Packaging Digest, EUROSAC, Confederation of European Paper Industries (CEPI) and company annual reports and publications. The report provides detailed competitive outlook including company profiles of key participants operating in the global market. Key players in the global sack kraft paper market include, The Mondi Group plc, BillerudKorsnas AB, KapStone Paper and Packaging Corporation, Segezha Group, Gascogne SA, Nordic Paper Holding AB, Natron-Hayat d.o.o., Horizon Pulp & Paper Ltd., Tolko Industries Ltd. and Canfor Corporation.